Is There an 8mm Video Cassette Adapter? What About a Hi-8 Adapter? Is There an 8mm Video Cassette Adapter? What About a Hi-8 Adapter or 8mm Adapter? Unfortunately, If you’re looking for an 8mm video cassette adapter to play your video 8, Hi-8 or Digital 8 tapes in your home VCR, there is no such thing. There is, however, a way to still play your tapes. 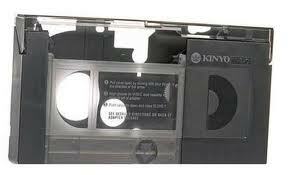 What you’ll need is a camcorder or a video tape player than can play 8mm video tapes. For their time, 8mm tapes such as Video8 and Hi-8 were great for recording day to day life such as your family events, soccer games, or your child’s first steps. These tapes were small enough to fit in a handheld camcorder, rather than a large, bulky shoulder-mounted camcorder which VHS tapes often required. Millions of consumers soon found the benefit of switching to the smaller sized tapes, as they offered similar recording times and even better quality picture than what VHS could offer. To counter this, the JVC company released the VHS-C tape (or compact VHS), which had the advantage of both being as small at the 8mm variety, and the capabilities to be used in an adapter to play on peoples VCRs. Where is the 8mm Video Cassette Adapter? This ended up being the one major downside to these Hi-8 and Video8 tapes. It was just not quite as simple to play the 8mm tapes back on your home TV as it was a VHS or VHS-C tape, as most homes were then equipped with VCRs for easily playing their VHS tape collections. The camcorders themselves, however, offered an easy hookup to most televisions via RCA cables, which allowed people to watch their footage on their TVs with little else to set up. Well, after a couple of decades, not many of us still have held onto the old 8mm video camcorder. Now, if you don’t still have your old camcorder, you have essentially lost a way to play or even to see what’s on your old 8mm tapes. When this happens, your whole collection of recordings are nearly be rendered useless unless you transfer the tapes to DVD or to your computer as digital video files. 2. Find a standalone deck that plays 8mm tapes. Please note that these are much more expensive than camcorders, but also allow additional dubbing and editing functionality. 3. If you’re unsure what kind of tapes you have, or can’t find a camcorder, you can always bring them to your local DVD Your Memories for our video to DVD transfer in San Diego, Irvine, Los Angeles or Denver. Plus, one of our video technicians can let you know which types of tapes you have, and also provide you some options for capturing or viewing your tapes. This entry was posted in General, Video Tape Transfer and tagged 8mm adapter, 8mm cassette adapter, 8mm tape, 8mm tape adapter, digital8 adapter, hi8, hi8 adapter, hi8 conversion, video8, video8 adapter, video8 conversion. Bookmark the permalink. 10 Responses to Is There an 8mm Video Cassette Adapter? What About a Hi-8 Adapter or 8mm Adapter? I have hi8 video tapes that I have when I had my sony hi8 camcorder and now I’m tryin to find an adaptor to fit my vhs…so I can put my hi8 tapes in side the video adaptor so it xan play on mu vhs,I can find any,anywere out here in hawaii..do you of a.place I can purchase.such an item? Hey there, unfortunately there is no such thing as an adapter from 8mm to VHS. The technology is too different for them to be cross compatible. Your best bet is to look for an old camcorder or video8 deck. good luck! Can you transfer cassette tapes to cd format. We can transfer both standard audio cassettes and microcassettes to CD or digital audio file which can be placed on your hard drive. Iwantto buy an adaptor that can play 8MM & HI8 in a VHS is it possible,please help me solve my problem. I have found a sharp VL-A45 to play old video tapes but for some reason it only plays one of my tapes and the others recorded on same sony hand held model which I don’t have anymore, it only plays sound. What can I do to get the picture to play as well? Please help. I was playing my old sanyo camcorder 8mm video tapes. Lots of interference but kept playing until it corrected itself with no interference. However the sound is not good and cannot hear the voices very well. I attached a loudspeaker to camcorder but no improvement. The camcorder could in time correct itself vis a vis the sound but doubt it. Watching ur video looks like there is no solution. Maybe to find another similar camcorder is the next possible solution and to ask around who has one that I could borrow.